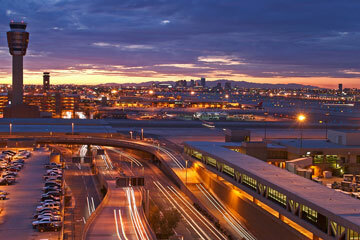 Leading airports in Arizona include the Phoenix Sky Harbor International Airport and the Tucson International Airport. More than 20 domestic and international airlines operate at Sky Harbor Airport. Tucson's airport features more than 80 daily nonstop departures to 24 destinations. Other major Arizona airports include the Flagstaff Pulliam Airport, the Grand Canyon National Park Airport, the Laughlin/Bullhead International Airport in Bullhead City, the Page Municipal Airport, and the Yuma International Airport. The photo at right is an aerial view of Phoenix Sky Harbor Airport. This Arizona airport map shows FAA-designated commercial service airports, reliever airports, and general aviation airports in the State of Arizona. Primary airports are designated with an airplane symbol. Arizona airport map source: FAA 2001-2005 NPIAS.